The best way to get to know a community is by scheduling a tour. See the facilities, meet the staff and residents, and get a feel first hand what it's like to live at Sunrise of Lynnwood Assisted Living. 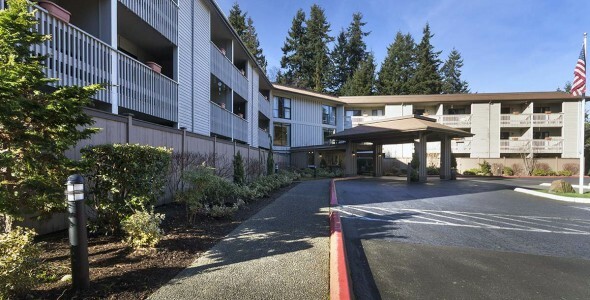 Our assisted living and memory care retirement community is located in the vibrant waterfront city of Edmonds. Our neighborhood location offers our residents the opportunity to enjoy the outdoors with plenty of sidewalks and green grass nearby, just like home. Relax and sip lemonade in our lovely garden courtyard, help yourself to freshly baked bread in our dining room, enjoy warming yourself by the fire and visiting with your neighbors in our comfortable living room are just a few ways you can spend your days. Our caring staff becomes like family and your neighbors are your friends. Sunrise of Lynwood is a part of the Sunrise Senior Living family of communities. Championing the quality of life for all seniors has been our mission since 1981. Our studio and one-bedroom apartments are designed to make life easy to navigate — reducing anxiety and frustration. Our emergency call system and safe bathrooms ensure comfort and safety for our residents. Three delicious, nutritious meals are provided each day, and family and friends are always welcome to join us for a meal. Personal and group activities provide enriching experiences on a daily basis. Individualized life histories, hobbies, and special interests are incorporated into our activity program. Daily activities include drum circle, spa time, trivia and classic movie night. Our care staff is properly trained to deliver nurturing care and communication, and understand that our residents need to feel valued, worthwhile. Care Managers are available 24 hours per day to assist you with the activities of daily living (such as bathing or dressing). A licensed nurse is available to monitor health needs. Blood pressure and weight checks are provided monthly. Residents may choose from daily meal specials or request a favorite from our chef. Beverages and snacks are available throughout the day. In addition to assisted living, Sunrise of Lynwood provides dedicated care for individuals living with Alzheimer’s or other dementia. This innovative program focuses on increasing the quality of life for our residents through social interaction and specially-designed living spaces which provide comfort and security. We would love to welcome you to our home. Please contact us to schedule a visit to Sunrise of Lynwood today.